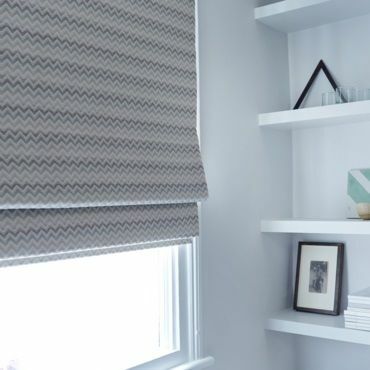 In the unlikely event that you’re having difficulty with one of our blinds, we’re here to help. Our troubleshooting guide includes easy-to-follow instructions to get your blind working as it should. Some fabrics, especially those made of natural fibres, are more prone to creasing than others. These creases will fall out naturally as the blind is lifted and lowered on a regular basis. All of our Roman blinds are made-to-measure and professionally fitted for a fabulous finish. If your Roman blind begins to hang unevenly, simply re-tie the cords at the back of the blind to restore its appearance. To do this, locate the cords at the rear of the blind, then detach them from the fabric by opening the plastic clips. With the cords detached, lower your blind as far as it will go using the sidewinder chain. When there is no slack left in the cords, re-tie any cords that are too long and make sure they are all the same length. To finish, reattach the cords at the back of your blind. We believe a child’s world should be safe and secure, which is why we fit child safety devices on all of our Roman blinds. If your blind has loose cords at the back, it is because this device has been activated, temporarily detaching the cord from the blind. To reattach it, simply insert the plastic clip that’s attached to the cord into the part that’s attached to the back of the blind. There are two simple solutions to try if the louvres on your Vertical blind won’t rotate. Firstly, unhook all of the louvres, then use the wand to turn the hooks to the side-on position. Reattach the louvres and your blind should be back to normal. If you’re still having some trouble, remove the louvres again and use the wand to turn the hooks in one direction, adding resistance until they are all perfectly aligned. If the hooks do not align, simply turn the hooks in the opposite direction until they are aligned. Don’t worry if your Vertical blind makes a few noises along the way, it has been made from the finest quality materials and will not break. If your Venetian or Wooden blind won’t tilt, remove your blind from its brackets and have a look inside the cassette. You’ll notice a long rod running the width of the blind, which should be inserted into a mechanism on the side of your blind where the wand or cords are located. If it has slipped out, it will need re-inserting. This should be done only when the blind’s slats are open and level (and the blind’s cords are hanging at the same length if you have a Wooden blind). Once re-inserted, your blind will tilt like new. Venetian or Wooden blinds that are stuck in this position should be removed from their brackets and inspected from the inside. It is likely that the cog that controls the movement of the blind has temporarily jammed. To relieve this, locate the cog which sits where the blind’s cords enter the headrail, then nudge it with a screwdriver or pen until it becomes loose. Once it’s back on its brackets, the blind will lift and lower as normal. The cords that operate our Pleated, Wooden and Faux Wood blinds are all fitted with plastic breakaway consolidators as a safety precaution. These small, tassel-like devices are designed to come apart when put under pressure, and are easily put back together again. Simply place the cord back inside one half of the consolidator, making sure that the knotted ends are fully inside, and attach the other half by clicking it together. If you are still having trouble operating your blind you can contact a member of our customer services team who will be happy to answer any questions you may have.